From Desktop to Doorstep in 4 to 7 Days! Perfect for Any Holiday Throughout the Year! Great quality and fast delivery! Most affordable too! Love this company for all our printing needs! Ordered custom note cards from Print Center USA. We communicated with them several times via phone and email. They made every effort to ensure that the cards received were what we needed. We were very pleased with both the service and the cards. We will definitely use Print Center USA again. The templates make accurate orders easier. I was confused by what two-sided meant. I thought the front and back of a card were two sides. An phone call and email were done to confirm my intentions. Everything looks great and shipped quickly. It would be nice to have some way to estimate approximate shipping costs before you get all the way to the end. I will be ordering again. I am happy with the process. Note card printing is cheap and easy to order online at PrintingCenterUSA.com. Incorporating affordable note card printing into your customer correspondence is an effective way to build stronger relationships and increase referrals. 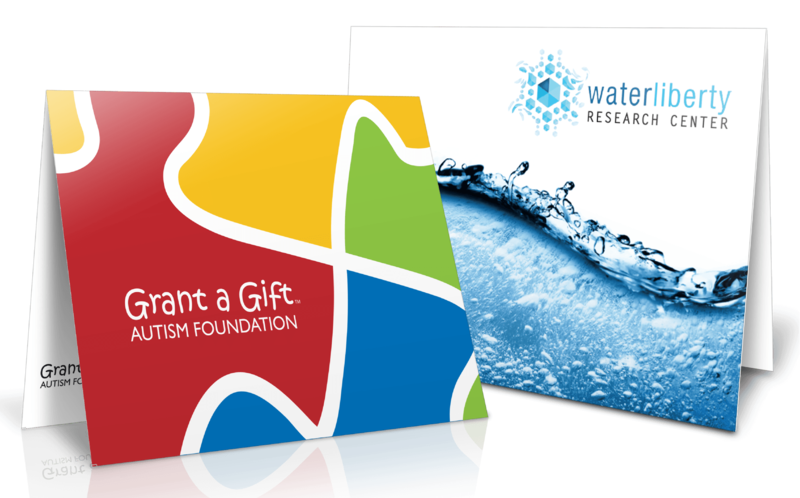 Note card printing options include digital or full color offset printing for 5.5 x 4.25 note cards. Our instant online note card quote system offers great prices on our standard paper, folding and finishing printing options. If you are looking for custom printed note cards, call for a quote or use our custom quote online ordering form for a price within 24 hours. Variable data printing is available on any digitally printed short run note card order. This allows you to print individual names, offers or other details specific to your customers directly on your note cards. An easy and hassle free way to send personalized note cards.UV coated note cards are an affordable way to get a high gloss, shiny finish for your note cards. The coated finish is only pennies more per piece and makes your note cards more durable. Create your own personal and custom 5.5 x 8.5 (5.5 x 4.25 when folded) Notecard with our online design tool! It is fun and easy to use and always FREE!